Honda’s venerable CB1000R sport standard bridges the gap between performance and bare-boned Café Racer inspirations. The model boasts cutting-edge Neo-Sports Café styling, a capable chassis and an advanced electronics package—all characteristics that bolster performance while highlighting the importance of a strong, emotional connection between rider and machine. Originally introduced in Europe in 2007, the CB1000R has always been designed for versatility through the classic Honda formula of high performance in a naked four-cylinder machine. It embraces retro-inspired design through a compact and aggressive layout, satisfying the needs of a growing audience—customers who desire a motorcycle that performs aptly but also features retro-minimalist looks that inspire emotion. The CB1000R’s styling deliberately separates it from the naked-bike mainstream, touting a powerful stance and an elevated performance package. The proportions are compact, with a trapezoid silhouette. The minimal overhang of the distinctly styled round headlight and the swingarm-mounted rear mudguard unit (a first for Honda) allow for an extremely short, sculpted aluminum tail unit that incorporates neat, under-slung passenger handholds. The CB1000R has a mono-backbone steel frame that uses split-tightening aluminum pivot plates to save weight. Mounted to those plates is a signature single-sided swingarm, which is just 22.6 inches long. Front suspension is an adjustable Showa Separate Function Fr Fork Big Piston unit (SFF-BP). All of the damping function is contained in one leg for minimal weight, and the fork delivers compliance, comfort, and control across a broad range of riding conditions. The Showa shock has adjustable spring preload, compression damping, and rebound damping. The CB1000R’s 998cc DOHC four-cylinder engine—which shares its architecture and layout with the previous-generation CBR1000RR super sport bike—provides ample power and torque. Bore and stroke are 75mm x 56.5mm, while compression ratio is 11.6:1 and the pistons are forged (rather than cast), as with the CBR1000RR SP. A 44mm diameter throttle body feeds large-diameter inlet ports. The airbox, ducting, and air filter present a simple, smooth route for airflow into the engine, reducing pressure loss all the way from the outer ducts to the throttle body. The assist/slipper clutch offers light lever pull and helps manage aggressive downshifts. 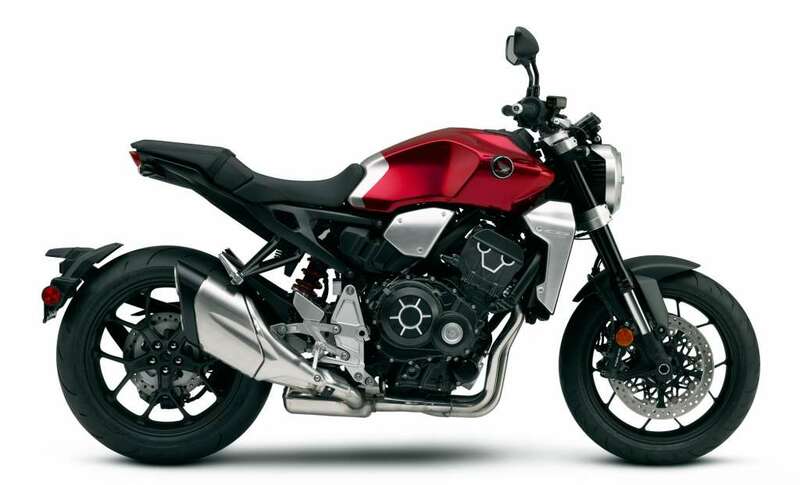 A 4-2-1 design exhaust system helps the CB1000R’s midrange muscle, and a link pipe joins the two main pipes just before the catalyzers, boosting torque at 5,000 rpm and above. The system is light at just 24.7 pounds, and as engine speed rises past 5,500 rpm, the machine takes on a deep, raw tone. Throttle By Wire (TBW) allows the rider various options for utilizing the powerful engine, via three preset riding modes plus 1 USER mode (selected from a switch on the left handlebar). Every athlete knows you gotta breathe to perform. Compared to earlier engine designs in this class, the 2019 CB1000R gets higher valve lift, larger valves, larger diameter inlet ports, and new combustion-chamber shapes to improve gas flow and offer improved torque in midrange. 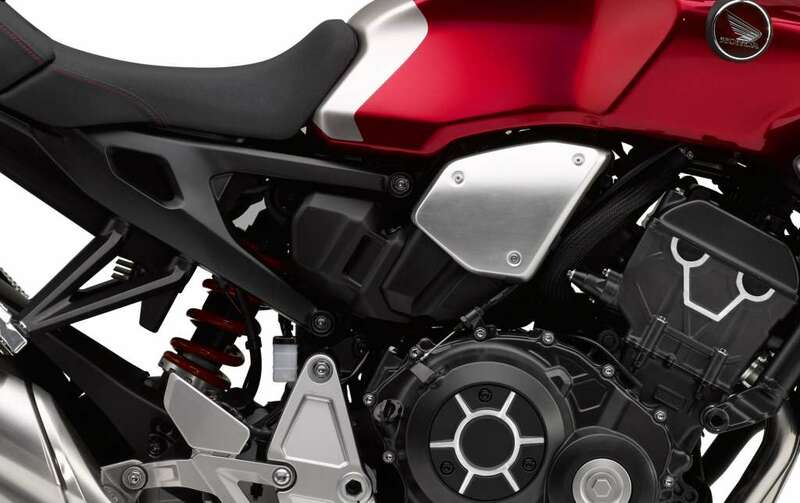 We fit the 2019 CB1000R’s close-ratio six-speed transmission with gearing designed to emphasize the bike’s awesome acceleration. Crack the throttle and you’ll feel it instantly. 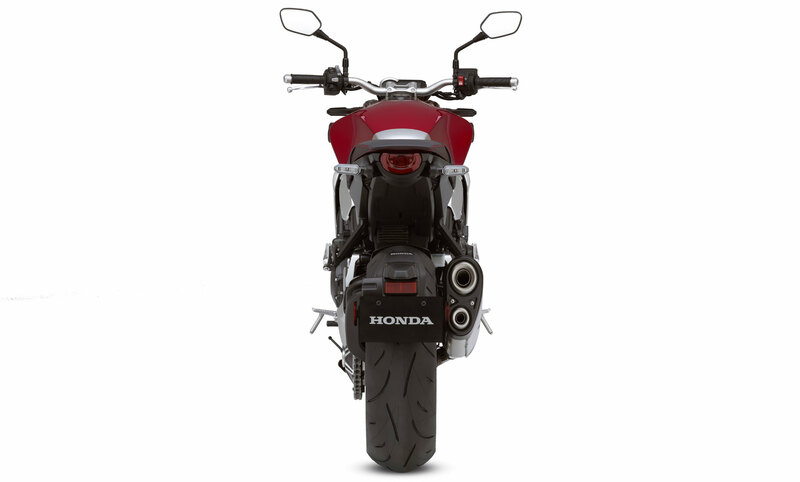 The CB1000R uses our throttle by wire system. In addition, we’ve given it four riding modes (Standard, Sport, Rain and User). The last one lets you choose between three settings for each parameter, and save the settings. The wide, tapered-section handlebar sits up high for a more relaxed riding position, making this Neo-Sports Café machine ideal for around-town rides. The bar also transmits excellent feedback for precise steering. At just 467 pounds, the CB1000R is in the welterweight champion class. For an open-class inline four, there’s not an ounce of fat here. That not only helps performance, but contributes to better handling too, and makes the bike more fun to ride just about everywhere. Great handling and precise steering demand a premium front suspension. That’s why the CB1000R uses a Showa Separate Function Front Fork Big Piston unit (SFF-BP). It offers both reduced weight, superior rigidity, and excellent overall performance. Plus it offers adjustability for spring preload as well as rebound and compression damping. Our front and rear Anti-Lock Braking System (standard on the CB1000R) can be a big help in making controlled stops in less-than-ideal conditions, like on wet pavement or other compromised surfaces. Details matter. Case in point: the CB1000R’s fuel tank. We build it without a visible bottom flange. Sure, it takes a little more effort to manufacture, but you get a fuel tank with a clean, custom look that we think is worth it. Plus, the tank is slimmer for an even better fit and lighter feel thanks to its unique shape. The CB1000R’s round-styled LED headlight is powerful and bright, and sets the tone for the bike’s no-nonsense Neo-Sports Café streetfighter presence. Take a close, long look at the details on this bike. The CB1000R sends a subtle message that this is a premium machine. Check out the burnished-aluminum radiator shroud and airbox cover, along with the engine cases, cylinder head, and sprocket hub. The CB1000R features LED lighting through and through. The lights are bright, more compact, lighter, and feature an incredibly long life. And check out the horseshoe-shaped light ring—it brings a modern flare to the bike’s traditional styling. A first for Honda, and you’re seeing it here. The rear splashguard/fender mounts directly to the swingarm for a fresh, sharp styling touch. Check out all the steel and aluminum alloy detail on this bike. The metal components send a definite message: the CB1000R is all business.